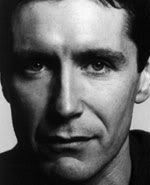 Actor Paul McGann has hit out at the decision by the British Advertising Clearance Centre (BACC) to veto a charity TV ad for which he provides the voice over. The World Vision television ad focuses on the supposed £49 million cost of sponsoring the England team alongside the 60 pence a day it costs to sponsor a child in the developing world. BACC vetoed the ad on the grounds it was an “unfair attack” on football and that it referred to entities, such as the Football Association, without their permission. World Vision are now considering whether to go to appeal over BACC’s decision. He added that the FA and footballers did carry out a huge amount of work for charity. I wonder if Paul has a sponsored child of his own. I love that he loves children. My mom's been to Malawi and seen children playing with footballs (soccer balls) just like that. She bought one from a little boy made of old cloth and string. Or maybe she traded it for a t-shirt or a baseball cap. She took a lot of those to give away. The ball was made of cloth and string, not the boy. And an amazing little toy bicycle made from old wires! Actor Paul McGann has spoken out in support of charity World Vision as news broke of the British Advertising Clearance Centre’s (BACC) ban on the airing of their new TV advert. 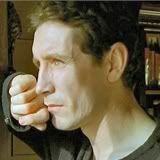 Paul McGann supplied the voice-over for the ad which shows a child in Malawi making a football from plastic bags and string. The BACC banned the ad on the basis that it was ‘unfair to football’ as it mentioned the £49 million it cost to sponsor the England football team alongside the 60p a day it costs to sponsor Masidi - the boy in the film. 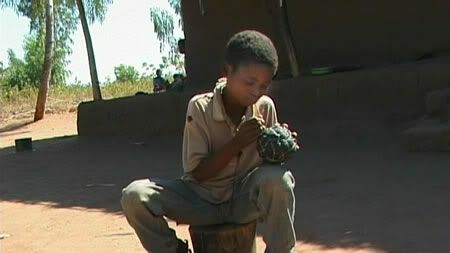 The ad, which can be viewed on World Vision’s website, was filmed by the young boy who stars in it. Communities were given broadcast-quality cameras and Masidi chose to film his favourite past time – football. In Malawi, however, footballs are hard to come by, so Masidi makes his from maize, plastic bags and string before joining his friends for a skilled kick-about – in bare feet. A thirty second ad compares the three years it took to develop the World Cup ball with the ten minutes it takes Masidi to make his match ball. The advert was created by London agency FCBi. World Vision, which planned to screen the adverts during the World Cup to encourage people to sponsor a child in the developing world, was shocked to receive the findings and is considering an appeal against the decision. The BACC ruling means that the advert has effectively been barred from appearing on television unless the England Football team gives its permission for World Vision to do so. World Vision has made an approach to the Football Association (FA) for this but they have declined to comment on the ad or the BACC’s decision. “We’re extremely surprised that the BACC has given this ruling,” comments Rudo Kwaramba, Director of Advocacy, Communications and Education at World Vision. In the vetoed ad Masidi is clearly a very happy child playing football with his friends, and the punchline is “Sometimes it doesn’t cost millions to make a real difference”. World Vision sponsors include several high profile footballers and in a recent child sponsorship campaign, Scottish and Northern Ireland footballers, including Rangers player Fernando Ricksen, played with a ball made from rags to show their support for child sponsorship. World Vision will post the ads on its website so that others can make up their own minds. The adverts in question can be viewed by clicking here and downloading them to any desktop. ftp://WorldVisionUK:lCFk97d5@ldn-ftp.truenorth.com. As Kurt Vonnegut used as a running line for his character in "Hocus Pocus", the character would say it as a response to just about everything and anything. It was just about all the guy said everytime he was promted to speak.... "I could have laughed like hell..."
Here in the USA, if the National Football League didn't want it aired, they'd have to do it through legal channels. Some kind of legal action would have to be taken regarding defamation or something---if the football association saw it that way. They'd have to claim a legal reason to keep it off the air, because banning or censoring it would be considered unconstitutional with regard to freedom of speech. If an entity has enough money to buy expensive tv time, as long as an ad didn't violate FCC (Federal Communication Commission) rules, they can air it. You know all those local home grown commercials you see in the middle of the night or early mornings....car dealerships and furniture stores....anything goes, as long as it doesn't violate FCC rules and they can pay for it. Is the BACC a part of the British Government? Or is it a private business entity? All these tidbits of whose who makes the story more intriguing. I'm given to think about the banning of The Biographer in the UK. Same thing, different reasons and different consequences. I'm surprised they don't do something like that during the Football playoffs here or during the Superbowl. People tune in just to watch the commercials. I wonder if the FCC would let them, or if they'd take them to court? I don't know much about the laws in the US or UK, but I would think a network that is selling airtime would have the right to determine if they wanted to air something or not. Networks pay lots of money for the rights to televise football games, specially big tournaments like the World Cup or the European Championships and I would believe they would not want to air something that could potentially show their country's football associations in a poor light. As unpopular as my opinion may turn out to be, I can't believe that World Vision could not have sent the same message, with the same visuals, in a different way and that they didn't think that the FA would not take offense. The cynical part of me wonders whether it was not done on purpose to get some publicity. It's hard to say not having seen the ad. Both sides claim differences in how the ad seems, it's intent, presentation and it's message. A perfect legal issue to argue in the making. The ad must have cost a pretty penny to get airtime during the cup playoffs, that's for sure. Now that one thinks of it, it does have some interesting legal and ethical contradictions. I recall something that happened a few years ago with Oprah, of all people. She said something on her show about the Beef Industry which they didn't like, about not eating meat or something and they took her to court about it. Because she has a lot of public influence and all that. It came out in Oprah's favor. But I believe that here in the USA, it would come down to the legal matter of defamation? "Transmission to others of false statements that harm the reputation , business, or property rights of a person. Spoken defamation is slander, and written defamation is libel." Here, the football association or maybe even the network airing it, who could loose a lot of money and might be a part in the case, could file a defamation suit. The federal govt wouldn't be able to bann the ad outright unless it violated FCC regulations. I wonder if defamation is in the FCC regulations somehow? They must, or people with lots of money would pay for ads and commercial air time to say whatever they wanted, claiming freedom of speech. They seem to air ugly political ads which trash the opponents and opposing political parties, and about certain contraversial issues, don't they? I wonder how that gets past the FCC, and not say...KKK ads, or what have you? I'm sure they have specific lines that can't be crossed. If that wasn't the case (no FCC violations), then it would go through the civil court system first (if it had merit--legal reasoning to justify taking it to court) it might make it's way up through the court system to the higher courts if it involves constitutional rights. I'm no lawyer, but that's the little I've read about. The federal govt wouldn't be able to bann the ad outright unless it violated FCC regulations. I very much doubt that they would force a network to air an ad the network objected to as well. Don't forget networks sell their air time, and just like a bar owner could refuse anyone service, I imagine the networks can choose the ads they want to air... or not as in this case. I see what you're saying Gaby. Like a radio station that doesn't play certain songs, or a business that chooses not to serve a person or organization that they claim would harm their business or other customers in some way. On the one hand, a business is there to make money. A business has every right not to serve someone who acts inappropriately, behaves in a manner that causes harm to their business, or threatens other customers, or negatively impacts on their customers. On the other hand, even a business can be in violation of constitutional law. In this case, a network uses the public airwaves (bandwidth) and must comply with federal laws and regulations. A business (like a bar or store, or a college or school or a club) has to be careful who they choose not to serve, if it is preceived as violating constitutional law...say, like discrimination, like a restaurant or club or store that refuses to admit and serve women or a minority group. The business would have to use the defense that serving that customer would cause harm to their business and maybe impact their customers negatively, and that it wasn't because of discrimination or freedom of speech. Say, a customer who becomes violent whenever he drinks at that bar, and threatens customers. In that case, the customer might be breaking local criminal laws...and could be banned from the establishment. I can see that as a good defense. And then, the plaintive has the burden of prooving the business violated his or her rights, using a specific constitutional law--like discrimination or freedom of speech. That could be hard to proove unless they've got the evidence that their banning was specifically directed in that way. Like when a person applies for a job, is fired from a job, or can't get into a college, but thinks it's a violation but can't proove it was discrimination because they have no specific proof. Those would be the kinds of legal arguments they'd have to present and weigh out with regard to how it impacts the business, versus the constitutional rights of the individual or entity, in addition to the how this impacts the greater good of society as a whole (if it went up the court system). It's real interesting. I find this subject very interesting. Sorry I didn't have time to respond yesterday. Like I said earlier, I don't know about specific laws that may have been violated by the ban, and the article didn't mention if World Vision might pursue legal action, just that they would appeal the decision. I also wonder what legal rights networks have about what they air. Does anyone know if the BACC is a government agency? The Broadcast Advertising Clearance Centre (BACC) is a specialist body responsible for the pre-transmission examination and clearance of television advertisements. All advertisements being transmitted as a national television campaign on UK terrestrial and satellite channels should be submitted to the BACC for approval. The BACC is funded by commercial broadcasters who pay a quarterly copy clearance fee. Their website is http:/www.bacc.org.uk/bacc if you want any more info about them. Hope it helps. For what it's worth, I don't think any of our footballers would object - they support a lot of charity events, and many of them sponsor kids themselves through World Vision. I know they do, as do other athletes all over the world. Thanks for the info, Michelle. LONDON - Developing world charity ActionAid is looking to create a media first after its creative and media agencies successfully petitioned media regulator Ofcom to be allowed to air an infomercial on shopping channels. Creative agency Watson Philips Norman, in a joint effort with media agency Mike Colling & Co, negotiated with the Broadcast Advertising Clearance Centre about the interpretation of Ofcom advertising regulations to push through the iniatiative. Ofcom regulations have so far prevented charities from exploiting shopping channel infomercials -- typically 15-minute, paid-for programmes -- because they specify that infomercials can only be aired to sell products and not solicit donations from the viewing audience. However, the BACC agreed that ActionAid's child sponsorship programme should be counted as a product because donors subscribe and receive regular reports or letters describing the progress being made by the child they are helping. WPN's creative director Maria Phillips and head of TV Sandra Money then created an infomercial using the agency's own footage shot on location at ActionAid projects in India and Africa. It features a voiceover by actor Paul McGann and music by Clannad, Enya, Nitin Sawhney and The Pretenders. Production was handled by Andrew Guy at Eye to Eye. Gail Cookson, client services director at WPN, said: "This is an incredible step forward for ActionAid with a compelling product, emotive footage and a whole new media opportunity which has previously been denied to charities." Joanne Smith, ActionAid's director of fundraising, said: "Sandra and Maria have created a very hard-hitting film that speaks volumes about our work." You know...I saw the ad in question last week on Sky News while I was in London (it seems to have been the 30-second version). It took me a second to figure out why it seemed familiar, having seen an article about it a while ago, but it was there. I guess the decision to ban has been changed? Or does Sky fall under a different jurisdiction? It's certainly not offensive at all, especially in the shorter version (not that the longer one is anything to get in a twist about, either).